​When we founded GoldStar Automation, we did so with a promise: to provide industry leading technology and new ideas to our customers. Sound easy? There is a lot happening in the world of automation and manufacturing. Spotting the next big thing is a challenge. Additionally, we decided that the solutions we represent should equally make sense to large organizations and medium to smaller companies. For instance, the robotic industry has literally launched the automation market into the next millennium. Gone are the days of robots exclusively making waves and saving resources in fortune 500 corporations. Collaborative technology, and the pervasive marketing that goes with it, dominates trade shows and magazines. We see it on weekly news programs and in commercial ads for major appliance and automotive manufacturers. Moreover, when once there were only one or two companies providing “cobots”, now most robot manufacturers have thrown their hat into the ring. A year ago, we found something very special in the middle of the collaborative whirlwind. When everyone else was trying to appear large and “cobotic”, Mecademic focused on a safe robot that promised simple to use programming techniques, an industrial stature and the most accurate, repeatable performance in the industry (5um). Especially unique about the Meca500, it is the most compact six-axis robot in the market. The Meca500 does not require a proprietary robot programming language to do work. With basic programming knowledge and the built-in controller, in the robot base, all you need is a laptop and you are ready to get started. The Meca500 is safe to work around operators, with due diligence, as it operates in a light class of payloads (.5kg). Think of the Meca500 as a plug and play tool, capable of the most complex, robotic operations. The Meca500 is an industrial tool, suitable for use in a typical factory setting. With polished aluminum body components, zero backlash gearing and encoder based servo motors on each joint, projects that require precision are achieved with amazing simplicity. Because the Meca500 is so compact and easy to transport, it is a great tool for universities and educational programs focused on robotic and automation technologies. GoldStar Automation is proud to provide this powerful tool to our customers. We are equally proud of our partners at Mecademic and their dedication to creating a robot unlike any other. Contact us soon to schedule your on-site demonstration. Marking for brand image or part traceability? Choose the specialists that guarantee quality and value. ​Product identification and branding is how you communicate to your customers that you can: trace each step of a production cycle, ensure quality by documenting critical data and apply your mark of approval which often times is your brand label. Technology is advancing more quickly in our industrial world, now more than ever. The way in which you make your mark is no exception. Options include mechanical, chemical and laser technology. Federal regulations and customer specifications require strict adherence to very specific criteria. Our direct part marking experts are here to guide you through this process. In order to address these challenges, we set our sights on finding the best quality, service and value in mechanical marking systems, including bench top designs, handheld tools and units designed for integration into any custom system. GoldStar Automation has partnered with Millennium Signatures to deliver A+ marks. Our goal is to deliver superior quality marking solutions in a flexible platform. For instance, high grade marks are now available in a portable, battery powered, bluetooth model. Each of our systems is available in dot peen and mechanical scribe versions. 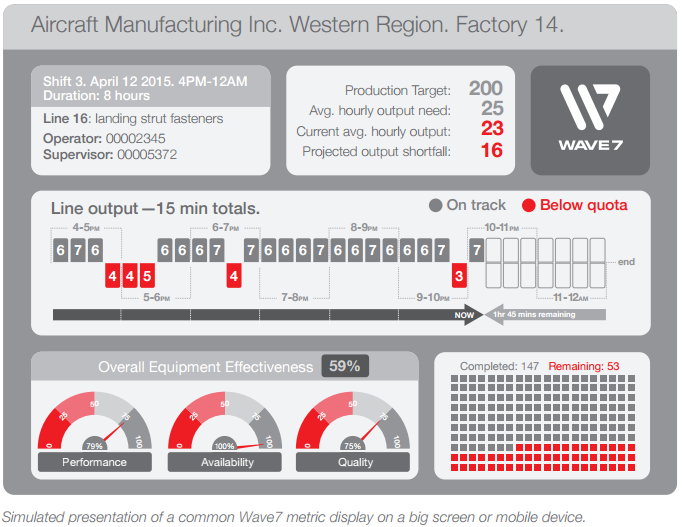 Simple, Affordable Production Tracking and Asset Monitoring In the Palm of Your Hand. If you have experienced counting the cost of downtime or struggled with unpredictable, ‘reactive’ maintenance, you already know how damaging this is to your business. Now, more than ever, it is easy to gain control of your operations by combining the hardware, software, security and services you need to manage your equipment more efficiently. How to choose the appropriate data? How to access critical data? To whom is the data disseminated? We have data, but how do we visualize it? How will this system interfere with existing IT restrictions? What is the initial hardware expense? How will the system expand with company needs? What maintenance is required for years to come? With standard charting and KPI packages, you cannot connect directly with your equipment – you only have access to a database. It's frustrating to learn that actionable information is buried in a complex software program. How can you access this data? How will the system be maintained? Often, the answer requires additional expertise from outside your company and the proposition becomes more complex and expensive than you bargained for. 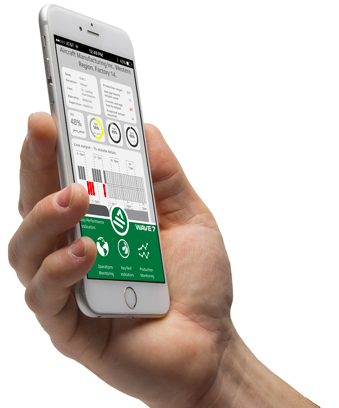 But, what if it doesn't have to be that way..
What if you could monitor conditions, operations and production right from your smartphone- while potentially saving millions in maintenance costs and improved uptime? What if you could use that system to manage each of your assets from anywhere in the world, at any time, regardless of where they are located? What if as an OEM, you could package this solution on each machine you deploy, adding an instant revenue stream to your bottom line. And what if you could start doing that now, without needing a costly or complex infrastructure project with multiple providers? ​Take control of your company's production assets today! GoldStar Automation has vetted and interviewed several suppliers of production tracking solutions. Each solution had merit and did a very good job of “grabbing” data from plant assets. Only one company leap frogged the competition to offer the one thing that is missing from the rest of the pack. ​Wave7 provides an immediate improvement to your bottom line. Start with one, or several assets and realize immediate returns. Each connection (Droplet) is a complete Wave7 system that is modular and achieves scalability from one to hundreds of assets. OEMs that rely on spare parts and service as their main post-delivery revenue now have a powerful value proposition- deliver traceability on each machine and offer as a service to the end customer. The solution to gaining control of your company’s most important metric, it’s efficiency, is closer than you thought. Contact the automation experts at GoldStar Automation to help you get started. Congratulations! You have taken the first step in implementing automation into your organization. Or, this is a path you have traveled before and you have decided that adding additional automation is the key to increasing profits for your company. Make no mistake, everything we do is inherently related to profit in our business lives: reducing quality concerns, increasing throughput, obtaining real time production data and, especially, addressing worker safety and job satisfaction. What’s next? For many companies, this phase presents the first big challenge. Your company has excelled at the craft of building your product, or products. Through trial and opportunity, you have developed a process that works. Customers are buying and everyone is happy until, something happens. Demand sharply increases, a sudden defect in production is realized, there is a change in workforce; we could list many reasons that increase the pressure to automate. Many companies find, as successful as they are at providing their product to the market, they know very little about adding automation to their production. There are too many things to consider and making one bad choice could negatively affect the entire project. GoldStar Automation is here to help. We have developed a practical, intuitive process that will walk you through this first phase and guide you to a successful conclusion for any project in automation. The G.O.L.D. Standard is a template you can use for all automation projects from automating a single work cell, to suiting an entire plant for automation. Every successful company has, at one time or another, had to take an honest inventory. To get to where you want to go, you must know where to begin. The goals you establish today will guide your company’s efforts for many months, even years to follow. We employ a thorough, consultative process with you to reveal known and unknown strengths. Based on these strengths, we establish short and long term goals. This approach is effective for automation projects small and large. After identifying your automation goals, establishing objectives becomes much less complicated and more focused. For example, your company is considering deploying a six axis robot into a production cell that is currently performed by manual operators. This is a goal. What are the objectives: increasing production rates, decreasing quality concerns, reducing labor costs, addressing operator strain? These are the perceived objectives, but there are certainly more to consider. What happens when adding a robot to your workforce introduces more complexity than you expected? That is where GoldStar Automation can help. The objective becomes, preparing your company for automation. We help identify tasks, approvals, roles and responsibilities that must be addressed along the way. With this kind of information, you will have a more complete picture that allows you to make an accurate cost analysis of what you suspected was a great idea. Many companies that desire to add automation to their process do not have a formal method of conveying this need to potential vendors. A scope document is a thorough and formal declaration of what a desired automation project needs to accomplish. Everything required for project success is in the scope document. This means that all deliverables and all management responsibilities must be understood and documented. If any work is missing, important activities may be absent from your schedule and your budget may be insufficient to cover all the cost. The definition of standard: a level of quality or attainment. 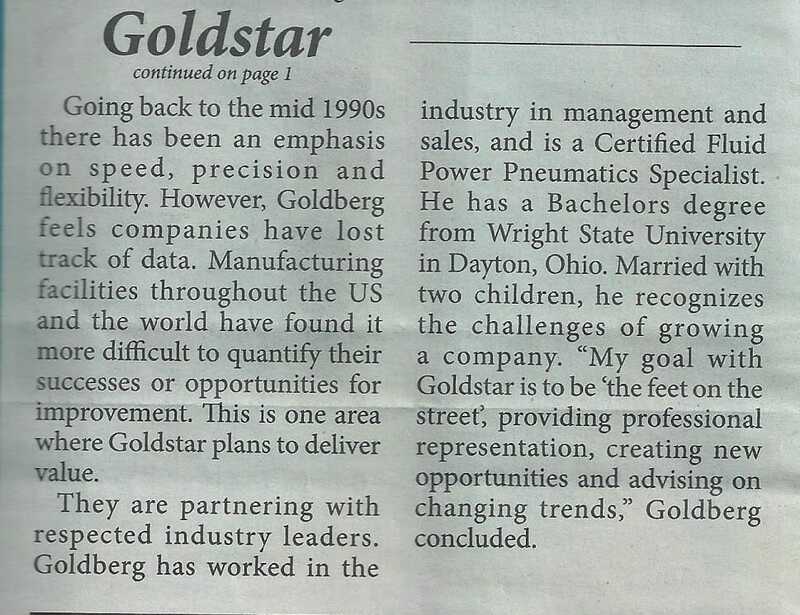 When you work with GoldStar Automation and our partners, we commit our best effort to every opportunity. Our experience and understanding of the items in this document are the result of years of successful automation projects. We are excited to deliver results that meet and exceed your expectations. 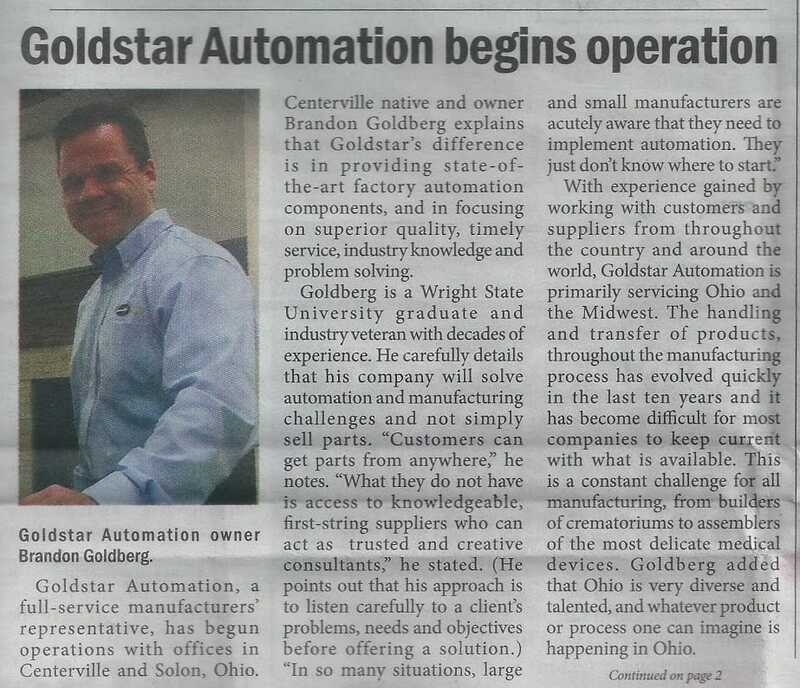 ​Touching a nerve in industry with their unique approach to automation, GoldStar Automation is making headlines! We are here to bring your vision to life!